By now we have all heard of edX—one of the major organizations who make MOOCs available to anyone who wants to take them. Courses on edX run on a codebase that is highly related to that of its two other platforms, one called edX Edge and the other—an open source version of the codebase—called Open edX. These are basically the same codebase, with implementation details optimized for different audiences and use cases. In the following I describe how the members of the edX family of learning platforms are related, how they differ, when to use each one, and how you can use them all in a coordinated fashion. Membership. Can only be created by edX Consortium members. These members come from higher education, nonprofits, and industry. Membership involves an up-front fee, an annual fee, and then a payment for each course on edX.org. Marketing channel. Available to the public at large on the edX.org Web site. edX acts as a marketing channel for the course. As a result of the power of the edX.org marketing channel, each course has a potential audience of millions of learners, with a typical course getting 25-50,000 students to enroll. Minimal customization. Significantly less customizable than an Open edX course, both in terms of theming and integration/plugins. IT support. Well supported out of the box; edX takes care of hosting, data exports, support, maintenance, etc. Membership. Can only be created by edX Consortium members. Targeted, closed courses. Are released to a targeted group (e.g., alumni, enrolled university students). No course catalog is available to the public. Minimal customization. Uses a codebase essentially identical to edX.org, so it also has little capability for customization. edX Edge can be used as a course development sandbox for a future edX.org course. The Open edX platform is more of an outlier compared to the previous two. Freely available. Can be downloaded and used by anybody or any organization at any time. Any audience. Can be used with any target audience—your department, your division, your whole company, only paying customers, or any and all members of the public. You set it up however you want. Open source. Starts with the codebase that forms the foundation of that used by edX.org. This leads to it being highly customizable in terms of theming and integration/plugins. Roll-your-own IT. Each organization has to take care of its own hosting, installation, course creation, support, maintenance, etc. The usual choice is to host your course on AWS. The edX family of learning platforms supports a range of course types. Only edX Consortium members can deploy courses on edX.org or edX Edge. If you are one of those organizations, then you can put your course on edX.org to reach 10s or 100s of thousands of students in a fairly straight-forward manner. You could be like UBC and use edX Edge to support on-campus courses as well as courses in their own online and distance learning programs. If you are not a partner of edX, you can still use the Open edX platform in any way that you like. As you can see from this list of courses, just about any course in any language can be supported by the platform. You don’t get the benefit of either the edX marketing muscle or their superb out-of-the-box support for running the course, but you can customize the platform in an essentially unlimited number of ways. You can also fully integrate the courses into your organization’s student information system, human resource system, or whatnot. MOOC as marketing channel. You can use the Open edX platform to offer SPOCs related to previously offered MOOCs, where the MOOC is used as a tool to attract students to the SPOC. MOOC as introduction to SPOC or on-campus course. You can use resources that you have deployed on a MOOC as introductory material for a more in-depth revenue-producing SPOC whose existence only became a reality after the success of the MOOC. Similarly, that material could be rolled into an on-campus course that you are hosting on edX Edge. MOOC and SPOC for integrated student recruiting. You can apply these resources to improving your applicant pool by, for example, using a MOOC as a form of marketing, and then using a related SPOC to provide a more intense, personal experience to those students who show interest. MOOC as service to alumni base. MOOCs might also be used as part of the school’s alumni engagement strategy; the school might have special events (in a SPOC or in-person) related to the MOOC for alumni who sign up and participate in the course. Your imagination is your only limit to how courses on Open edX can be linked to courses on edX. 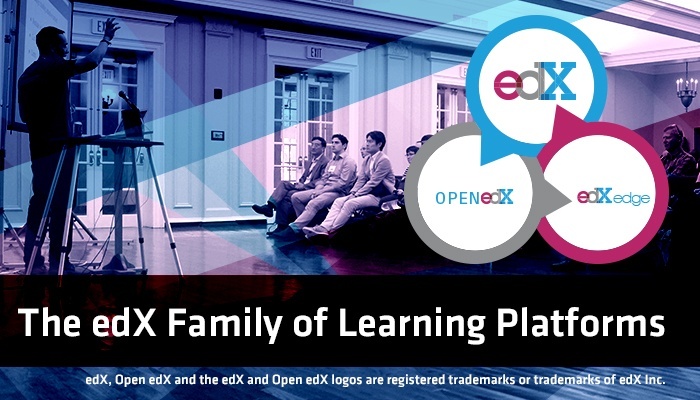 That’s my overview of the edX family of learning platforms. Each one has its focus, but resources developed for one can easily be used in the others. If your organization has plans for multiple deployments of learning resources, then committing to this family should reduce your cost of re-use while also opening up a wide range of strategies and tactics for your organization. Of course, if you need a partner for doing any of the above, ExtensionEngine is the world’s #1 provider of Open edX solutions (with deep expertise in MOOCs and SPOCs on many platforms), so consider partnering with us as you strategize, plan, and roll-out your online and blended courses.